These caps continue immediately from the others, but there were too many to post at once. Believe it or not, I really did toss some frames out, but these I had to keep. 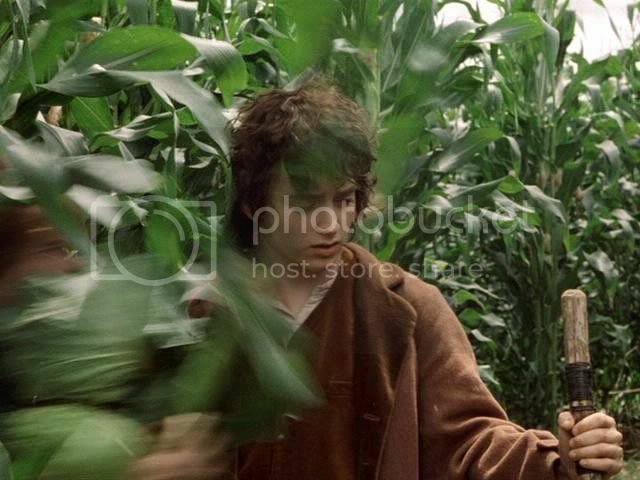 As can be seen, Frodo is just about to be tackled. He senses something is just about to burst upon him. The next seven detail the Pounce of Pippin. I kept most of the frames, simply because they crack me up. No, I didn't think it was a slashy scene in the film, but I have read enough P/F fic, especially fics that rely heavily on Billy Boyd's Pippin for their characterization, to think these frames are extremely entertaining in a way the filmmakers did not intend (probably). I finished up with the group shot I thought extremely good and clear. Oh yes...lips... *thuds* And eyebrows, too, I just adore the way they are so thick and perfectly curled. 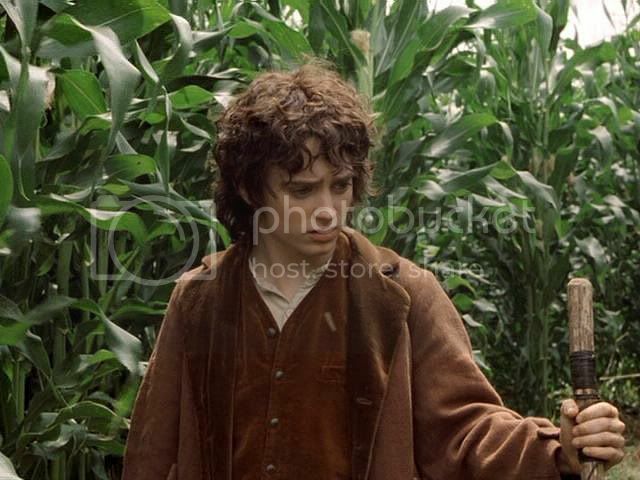 And doesn't the third pic, rather blurry though it is around the edges, seems to portray a Frodo deep in some luscious contemplation? With his eyes closed and his lips looking so utterly kissable... *guh* Wonderful caps, Mectild, as always. Thanks so much for sharing! Ah, the eyebrows, the strong, chiselled line of the chin, perfectly modelled, the lovely slim but wiry fingers wrapped around the staff. Ah, yes. Deep in luscious contemplation, indeed. I am, anyway. Wow! These are so gorgeous. No, what bangers? 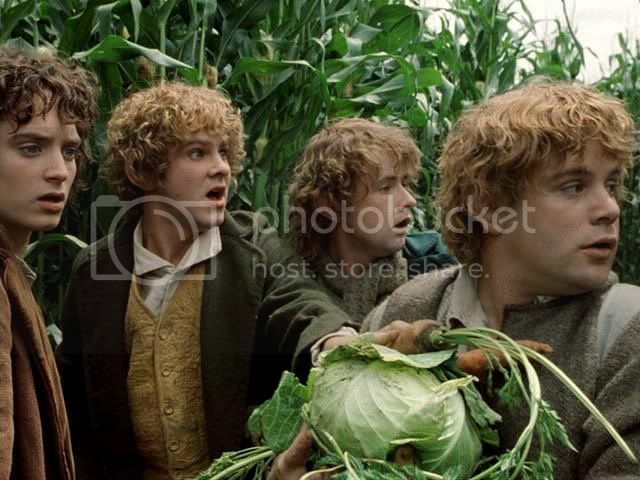 I only see carrots. Are you sure it's trailing out of his backback, or out of his trouser placket? Perhaps he forgot to button up after his trip into the corn to take that pee? Love all their expressions in the last one! Yes, it is awfully good. I was surprised I hadn't seen it around more. Shots in which all four are so in character, so expressive, and so in focus are not that many. You know, when you've got a lower lip that big, gravity just has to have its way with it. Lucky gravity! What a delightful series. Thanks for the happy fix, Mechtild! Gawd, you brought the flared nostrils icon in here. Another spanking for you. 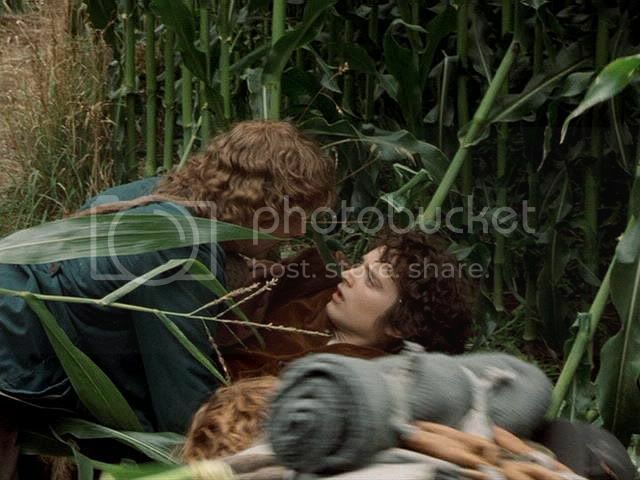 There, now Frodo will have to lay you across his lap. If you wriggle around enough, perhaps Frodo will be able to demonstrate that even if his petulant lower lip mayn't defy gravity, other things may. That will teach you a thing or too. Glad you have liked the corn. I just love seeing movie scenes this way. I don't have any screencapping software (or knowledge), so pleeeeeease keep them coming! Oh, I can't resist, in fact. Though I should be writing. Or wrapping and mailing gifts. Or calling my mother. Etc. The lusciousness of this series of caps never fails to leave me in a puddle of drool. And omg! 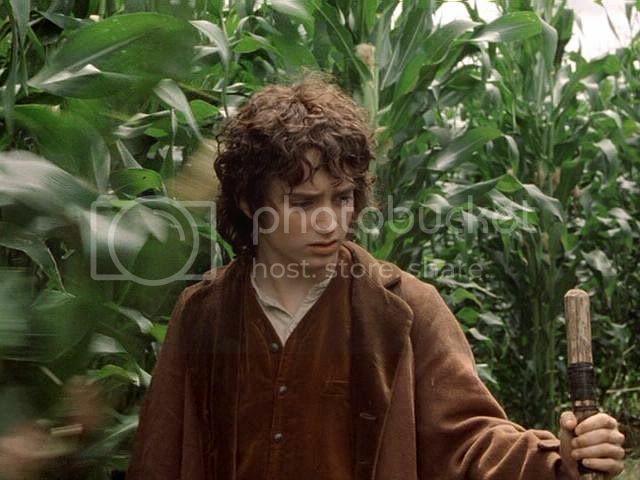 I have never noticed the sausages either, or much else regarding the other hobbits for that matter - Frodo is just far, far too gorgeous to take one's eyes off for even a millisecond!!! Baw-Haw! You guys are so funny! :D (and I've always loved that last shot there of the four of them looking towards the shouting voice in panic, hee hee!). Yeah, that is a great shot. I think it ought to have been a poster or a publicity still for the film. Hey, Lembas, Lady Wendy came by TORc and gave you links to "Elijah and the Crying Little Girl." Check it out, dollface. You are forgiven spending time modding. I suppose U2 fans are probably very intense, judging from Bono. Yes, he is terribly luscious and so are his lips. 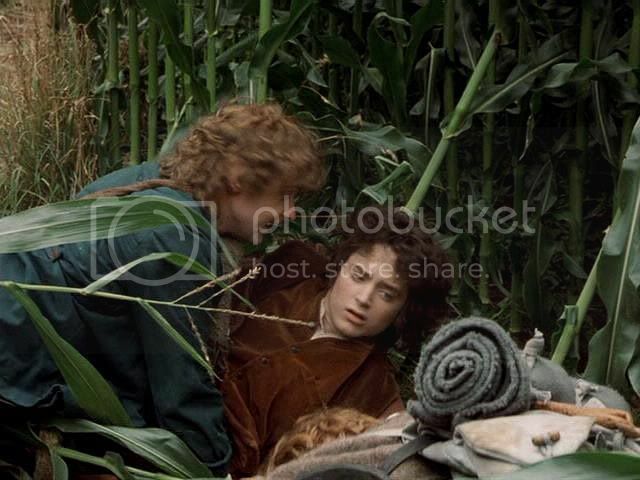 I don't think I gushed over them enough in my fic, trying not to be too film-Frodo specific. I remember reading that some critic was supposed to have said that. Maybe it was taken out of context, and it was all part of a complimentary passage comparing him to Liv Tyler. "He's shorter, has plainer costumes, and has got thinner lips. But Live doesn't hold a candle to him in beauty." You just go ahead, drool and whimper. You can use Frodo's santa hat in your icon to wipe your lips with. P.S. I made a new manip. It's on LJ and in the Harem as of a few hours ago. I think it's my new fave. Yes, it's full of youthful charm.